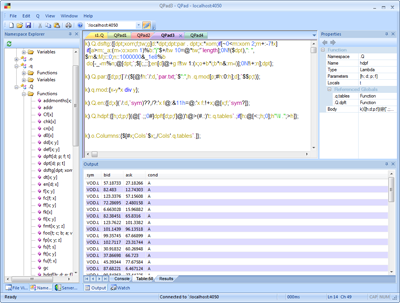 Q Insight Pad is a KDB+ client, written in C++ to run under Windows; as a result, it is fast, memory-efficient and easy to use. We make a special emphasis on providing a Windows-style GUI, that is visual, simple and intuitive. Download fully functional version for free (expires twice a year). See	change log for details. Believe it or not, QInsightPad quite simply runs under Windows. We are committed to having the minimum of dependencies on software packages, service packs, updates, etc.